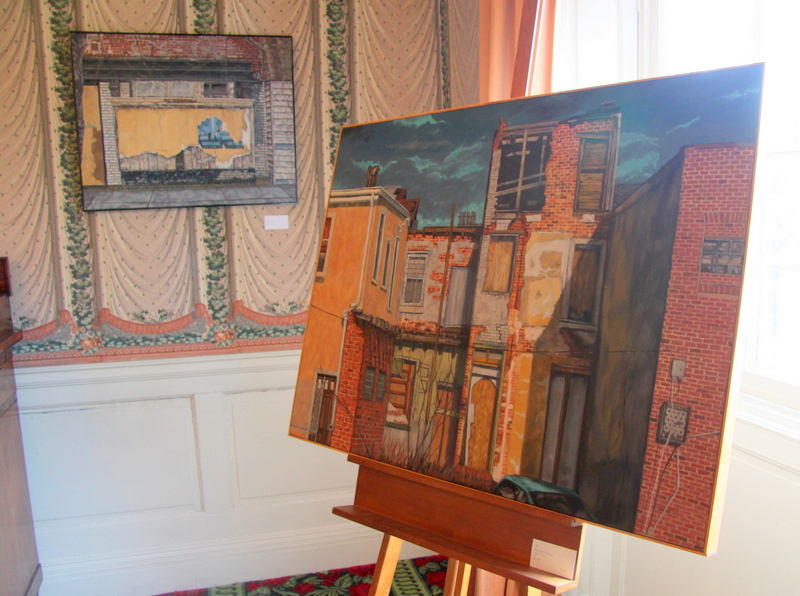 Above: Works from Greg McLemore’s “Baltimore Ruin” series, now on display at the Carroll Mansion. A ship in the Inner Harbor fairly groaning under the weight of a load of watermelons. A bustling scene of produce sellers outside Hollins Market. The William C. Scarlett Seed Co. building at Pratt and President streets. A view of the Bay near Smith Island in the murky twilight. Visitors to an art show at the Carroll Mansion – to benefit the rehabilitation of the Peale Museum – get a unique glimpse of past times in Baltimore and Maryland, and places they might not normally see. 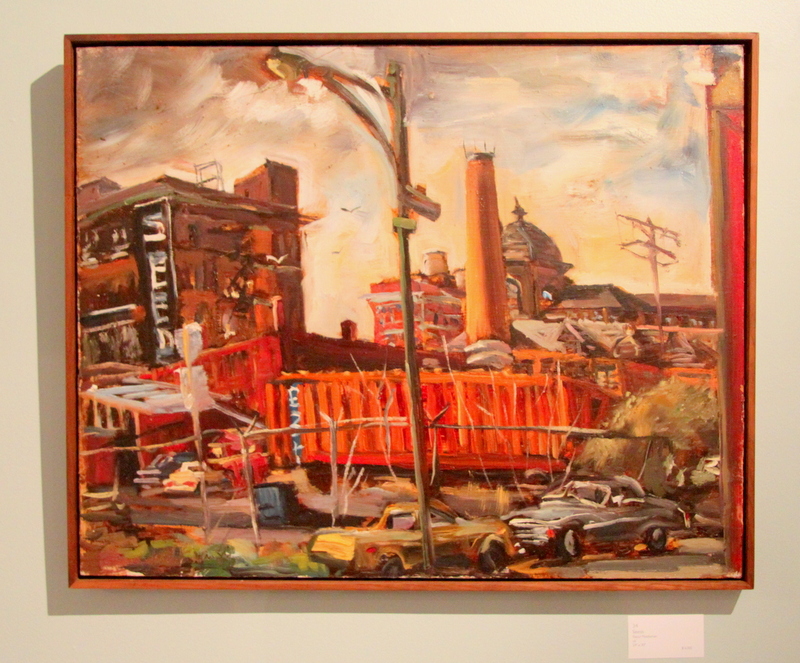 But even more intriguing is the contrast among the styles and worldviews of the artists who made each of these works. A. Aubrey Bodine’s black-and-white photo of the watermelon boat has a journalistic formalism. Jacob Glushakow’s muted tones and realism cast Hollins Market in a sentimental glow. Raoul Middleman’s aggressive, expressionist brushstrokes of the seed building depict a turbulent sky, gleaming orange brick-and-metal landscape and the feeling of a front moving in. On the other hand, Kevin Fitzgerald’s minimalist “Long Branch Clouds” draws you quietly in, like a Raymond Carver story, to a dark and poignant place. Visitors to “Free State at the Peale,” showing now through the end of November, get a rare chance to see these works and others by some of the region’s premier artists. 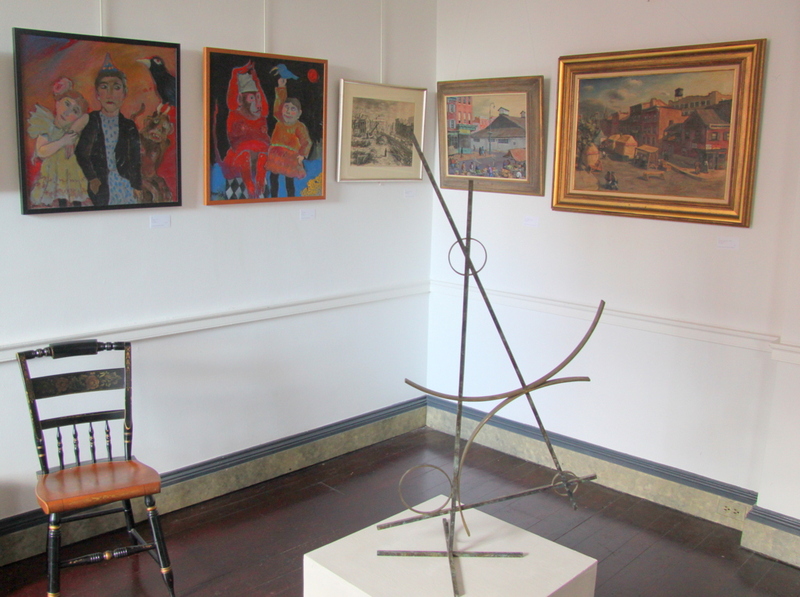 The show (they had a fundraiser and the art pieces are for sale) was organized as part of the Peale Center’s $4 million campaign to re-open the building, located at 225 North Holliday Street, which has been closed since 1997. The oldest museum building in the United States, the city-owned Peale is in need of major work, including roof repairs and new windows. 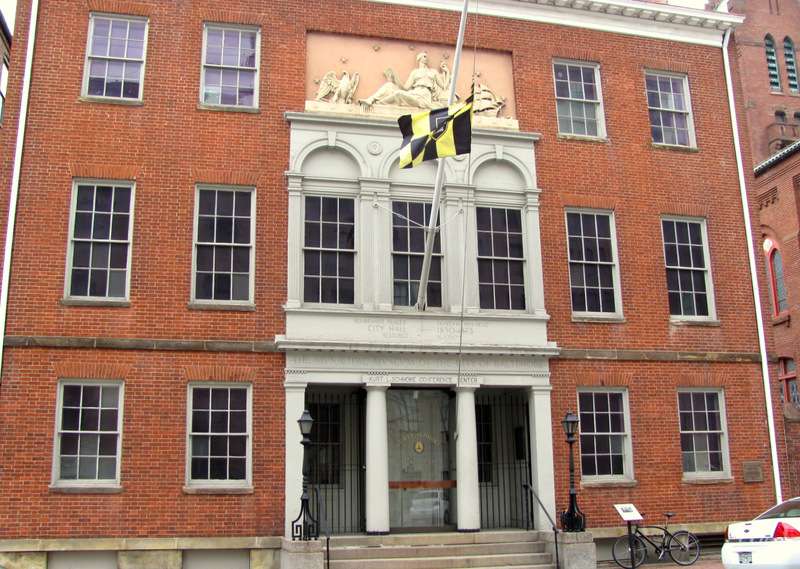 A non-profit group, the Peale Center, has been working to reopen the building to the public as a center for the study of Baltimore’s history and architecture. By organizing a juried art show, the organizers meant to pay tribute to the Peale’s 200 years of presenting fine art to the public. In addition to serving as a museum, the building has had other iterations over the years, including use as the first formal City Hall and as the Male and Female Colored School No. 1. 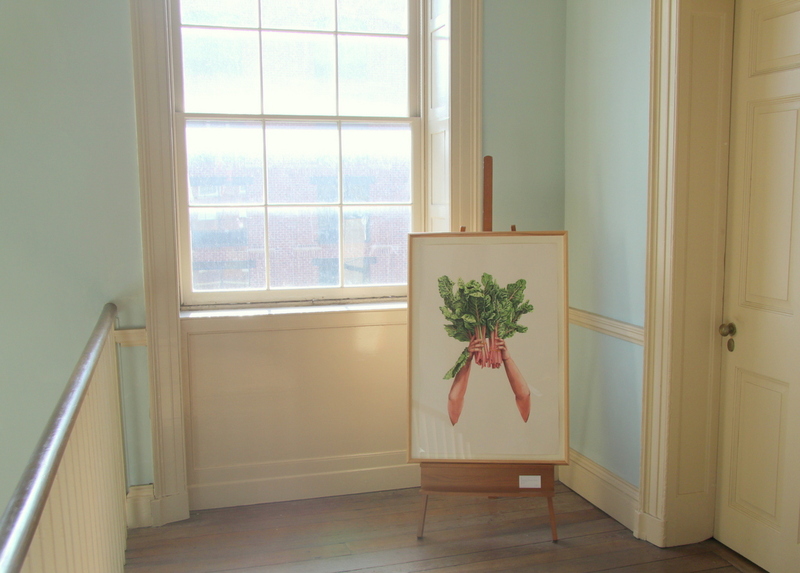 The current show, which includes several artists whose work was previously shown at the Peale, is mounted on three floors of the Carroll Mansion. In addition to those already mentioned, it includes pieces by Herman Maril, Keith Martin, Betty Cooke, Aaron Sopher, Reuben Kramer, Paul Moscatt, Amalie Rothschild, Joan Erbe, James Singewald, Thomas Gregory, Susan Kroiz Kreiger, Kathleen Kotarba, Walter Schamu, Joseph Sheppard, Leonard Streckfus, Alzaruba and others. 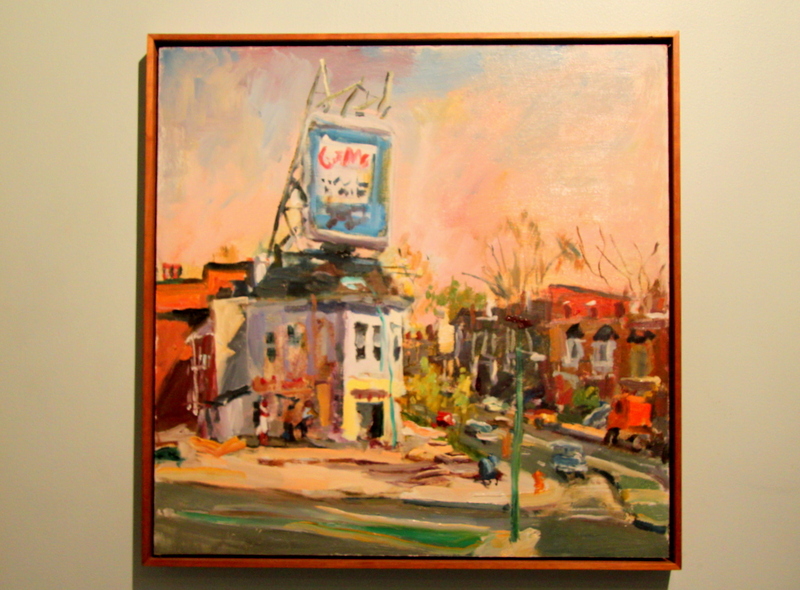 One theme of “Free State at the Peale,” perhaps an unintentional one, is the sense of a lost Baltimore. Bodine’s and Glushakow’s depictions of the Inner Harbor when it was a working waterfront, and city-owned markets when they were thriving, contrast with Singewald’s eerie recent photos of deserted and decrepit Old Town Mall. 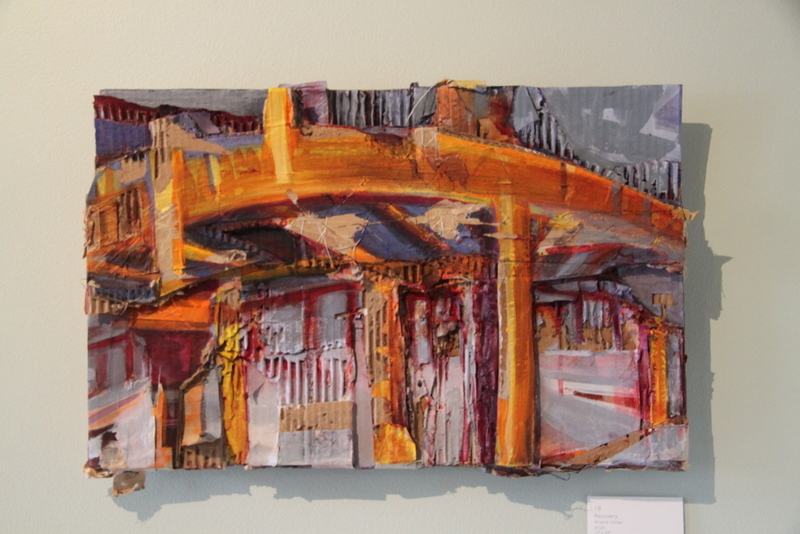 Likewise, there’s Greg McLemore’s “Baltimore Ruins” series depicting a derelict storefront today. “Recovery,” by Artemis Herber, is both contemporary and hopeful. A photograph of Mount Vernon in the falling snow is simply lovely. But I was struck also by Glushakow’s 1941 “Slum Clearance” with its heavy equipment pictured amid a block being demolished. It might just as well be a scene from the making of today’s East Baltimore Biopark or downtown’s Superblock – sweeping, slow-moving redevelopment projects that continue to generate resentment and debate. The representations of black Baltimore in the show are modest, but pack a punch. 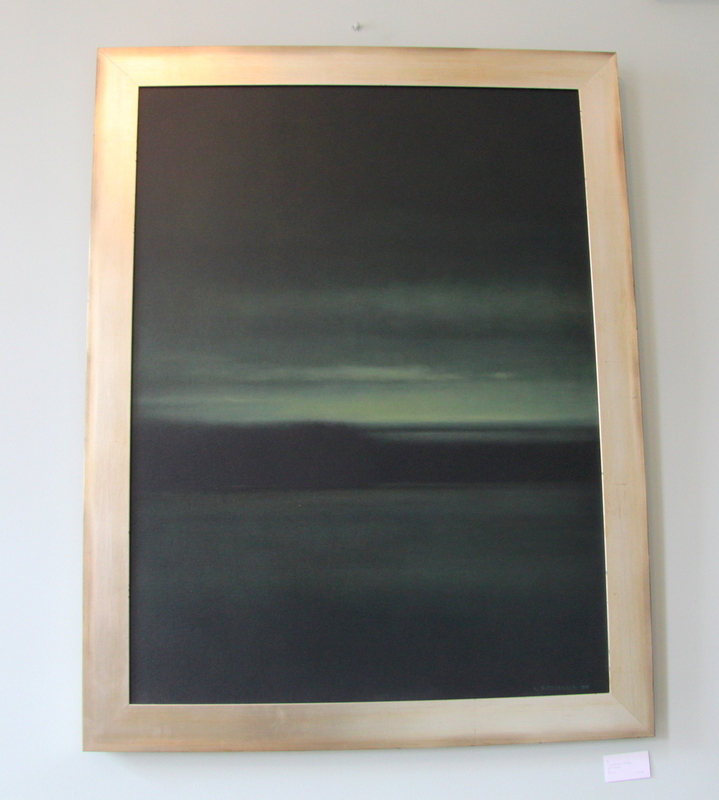 “A Baltimore Summer” by Candace Fong gives off a foreboding feeling. 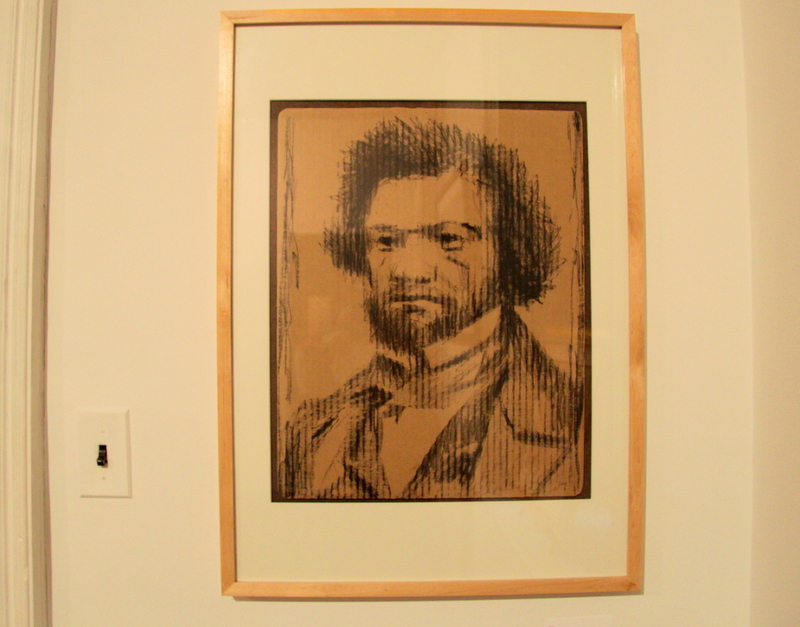 And the piercing “Portrait of Frederick Douglass” by Jamie Travers has an extra power because of what it’s drawn on – a piece of corrugated cardboard. The image seems to almost vibrate. Something else to notice when you go see this show is the interplay of the art with the building where it’s displayed, the Carroll Mansion, which opened in 1811. A structure close in age and proximity to the Peale, its rooms are grand and light-filled. It’s thought-provoking to see prints and paintings showing dilapidated vacant Baltimore rowhouses hung on walls covered with ornate, if in some spots water-stained, wallpaper. Coming up the grand staircase and turning a corner to see an exuberant and playful painting of hands lifting a bundle of Swiss chard to the sky is a kick. 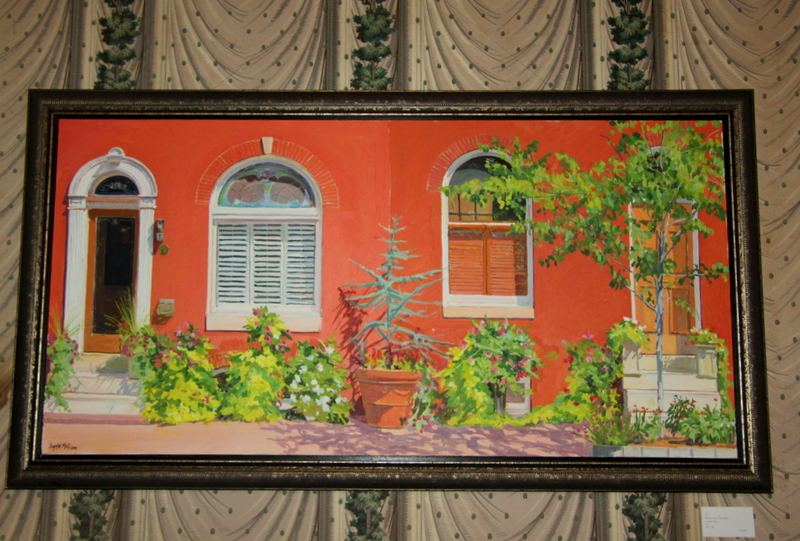 Seeing the piece framed by a tall and graceful Carroll Mansion window and bathed in morning light is especially cheering.